Have you asked yourself "Where do I start" when developing an assignment for your students? 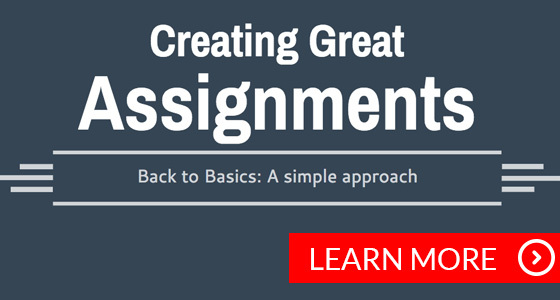 Review this step-by-step approach to create great assignments. Aboriginal Awareness Day was celebrated at Durham College on January 20th and showcased many aspects of Indigenous culture as seen in this video. The Aboriginal Student Centre is a great resource for faculty who want to learn more about Indigenous culture and how to include these perspectives in their classrooms. Contact the Aboriginal Student Centre to learn more. Are you undergoing Comprehensive Program Review this year? This process is often quite new to many faculty members, so please feel free to contact Emma Thacker, Program Review and Renewal Manager for questions about the process, or Shannon Webb, Curriculum Specialist for questions about Curriculum Mapping. View all upcoming PD Sessions on the Training Regsitration website. Are you looking for an opportunity to share teaching tips with colleagues at other colleges without having to leave the comfort of your own desk? Faculty Cyber Connections is designed for faculty wishing to advance their teaching practice through online collaboration with colleagues across Ontario. The design of the program enables participants to analyze teaching and learning strategies, while exploring emerging technologies. Three modules are being offered this winter: Group Work, Universal Design for Learning and Multiple Choice Tests. Registration deadline is February 20th, 2017. Thank you for reading our latest newsletter. Do you have any questions? Contact us today! Copyright © 2017 Durham College, All rights reserved.